New York-based Rafael Viñoly Architects has conceived a pair of residential towers for Chicago's growing South Loop neighbourhood, on a site overlooking a park. Viñoly was chosen for the project by the developer, Crescent Heights. The first phase calls for a 76-storey skyscraper with 792 rental units, to be built at 113 E Roosevelt Road. Slated to rise 829 feet (253 metres), the yet-to-be-named tower will be the tallest building in the South Loop neighbourhood, and one of the tallest residential towers in Chicago. "The building will include a diverse mix of dwellings, ranging from studios to three-bedroom units," said the developer in a statement. The project's second phase features a 648-unit condo tower to be constructed just west of the first skyscraper. 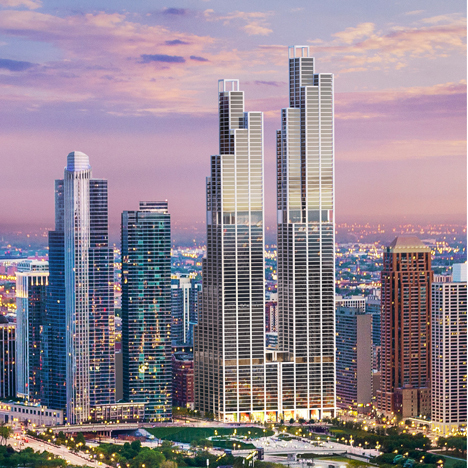 The two skyscrapers will overlook Grant Park and will be connected at ground level by a podium containing 125,000 square feet (11,600 square meters) of retail space. Renderings show two glassy towers made of elongated, vertical boxes that terminate at different heights. The design is slightly reminiscent of Chicago's Willis Tower, which is composed of stacked boxes. A third phase for the project entails the creation of a 100-unit townhouse community and park along Indiana Avenue, a thoroughfare that borders the eastern portion of the site. Viñoly has said the project is "not just an architectural idea, but an urban design idea," according to reports. The project was unveiled last week in Chicago at a public meeting and received mixed reviews. "The proposal is a pretty big deal for the South Loop, as the tower would not only be the neighbourhood's tallest at 829 feet, but it also ups the ante when it comes to selecting notable architects for projects in the area," wrote AJ LaTrace in Curbed Chicago. Other comments were not so favourable. "The aesthetic shown by the new site isn't going to do Chicago's renowned skyline any favours," wrote Edward Keegan in Crain's Chicago. This isn't Viñoly's first project in Chicago. The Uruguay-born architect designed the University of Chicago Booth School of Business, which was completed in 2004. On the same campus, he designed the Center for Care & Discovery, which opened in 2012. In London, the Viñoly-designed 20 Fenchurch Street, locally known as the Walkie Talkie, has received criticism for its hulking form and its curved glass facade that reportedly generates extra heat and wind on the street below. It was recently named the worst new building in the UK. Viñoly is also working on the supertall 432 Park Avenue tower in Manhattan, which is due to complete later this year.